b&b Les Marronniers is an ideal “starting point” for many excursions and activities, sparing you from changing accommodation. We will be delighted to advise you on itinerary ideas during your stay. At the heart of the Pays d’Auge region in Normandy, the village of Cambremer is located on the cider and calvados trail. Thanks to the quality of its cider products, its natural and architectural environment, and its tourist industry, Cambremer was awarded the quality label “Site remarquable du gout” in 2015 by 4 French ministries. We have joined the association that manages this trademark for Cambremer and we are committed to respecting its quality regulations. Les Marronniers is ideally situated between Lisieux and Caen, less than 2 hours’ drive from Paris, and 20 min from the beaches along the Côte Fleurie (Flower Coast). The numerous tourist sites, which include Deauville, Cabourg, Houlgate, Honfleur, Beuvron-en-Auge, Pont l’Evêque, Lisieux, its Basilica and Saint Therese, the Normandy Bridge, Falaise and William the Conqueror’s castle, Caen and its Memorial museum, Rouen with its 100 bell towers, Bayeux and its tapestry, Port-en-Bessin, the landing beaches, the American cemetery in Colleville-sur-mer and the German cemetery in La Cambe, the Mont-Saint-Michel, Fécamp and Etretat, are within close reach. All these sites are renowned worldwide but you will also find some very enchanting sites inland: the green countryside of the Pays d’Auge region, Norman Switzerland with its remote gorges and picturesque valleys, Bocage Virois, which is an area popular for woodland walks and river fishing, Caen and its surrounding area, and the town of Falaise, a historic Norman landmark and fife of William the Conqueror. So what is it that YOU are looking for in Normandy? for a weekend or a stay, come to spend a big moment of relaxation for two, with your children ( 2 family suites), in widened family or between friends (5 rooms and a gite at your disposal). 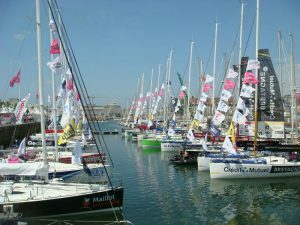 Normandy is often an ideal and » magic » place to meet and live unforgettable memories ! leave by chance and for ballads (eg la balade des haras ) on the small roads and the bucolic roads of the countryside of « pays d’Auge ». Let be amazed by an environment always greens where apple trees in flowers are a unique show all along the road some cider. Normandy is an ideal place for a stay in the green, which proposes in particular gardens and « remarkable » classified parks, countryside and protected coastal zones. Wildlife parks also propose you unforgettable meetings. 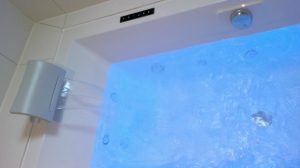 thalassotherapy centers (Ouistreham, cabourg, trouville, deauville, luc sur mer, etc…), fine sand beaches, swimming pools, aquatic parks (carpiquet, condé sur noireau, douvres la délivrande, falaise, lisieux, etc..), or … casinos wait for you. Normandy is a land of remembrance with its landing beaches, numerous museums (do not miss Pegasus Bridge, Ouistreham, Arromanches, Coleville cemetery, etc…), and of course the Peace Memorial Museum in Caen. 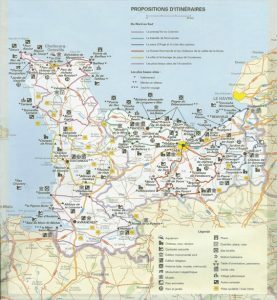 Normandy is home to a rich and unique heritage, Calvados in particular, being the department with the 3rd highest number of classified monuments in France. Over 800 civil and religious buildings tell 1000 years of history: castles and manors (Crévecoeur-en-Auge, Coupesarte, Saint-Germain-de-Livet), half-timbered houses in the Pays d’Auge region, fortified farmhouses in the Bessin region, thatched cottages and of course the unique architecture and seaside resorts along the Côte Fleurie (Cabourg, Houlgate, Trouville, Deauville). 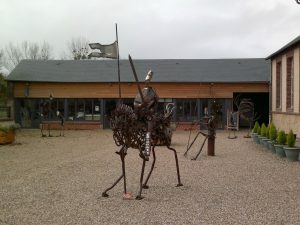 One of the best ways to soak up this history is to lose yourself on the country roads or stroll round one of the villages that, like Cambremer, have kept their authenticity. You will discover not only magnificent characteristic architecture (Beuvron-en-Auge, Beaumont-en-Auge), but also lively and hospitable places to visit. Calvados is unique for its 2 magnificent cathedrals: Bayeux and Lisieux. And, from Alençon to the Carmelite convent of Lisieux and the town’s splendid basilica, you can retrace the steps of Saint Thérèse of Lisieux. The Pays d’Auge region has been attributed the national quality label “Pays d’art et d’histoire” (“Land of Art and History”). Looking to treat your taste buds? Normandy dishes up a feast! Begin with a good breakfast at Les Marronniers. Visit the region’s weekly markets (Saint-Pierre-sur-Dives on Mondays, Lisieux on Saturdays, Trouville on Sundays) or our traditional markets in summer (Cambremer, Pont l’Evêque). Another must-see: the magnificent covered fish market in Trouville. Call in at one of the frequent fayres (cheese fayre in Livarot, Pont l’Evêque). 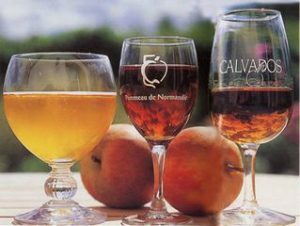 Visit the region’s AOC producers: on Cambremer’s Cider Route (apple cider, pear cider, Pommeau, Calvados). Discover the local producers of cheese (Domaine de Saint Hyppolite near Lisieux, Pont l’Evêque, Livarot, Camembert, Cœur de Neufchâtel). You’ll find it goes down nicely with a bit of AOC butter and cream . . .
For dessert: apple tart, Teurgoule (baked rice pudding, often with cinnamon), apple-filled pancakes, and don’t forget to order your “Cider Route” cake from the Cambremer bakery; it’s addictive. Alternatively you may wish to sample one of the high quality restaurants (c.f. our selection). Many are starred and others offer excellent local cuisine. The regions’ cheeses, crème fraîche, shellfish and other seafood, apple juice, cider, Pommeau and Calvados await you for some splendid gourmet experiences. 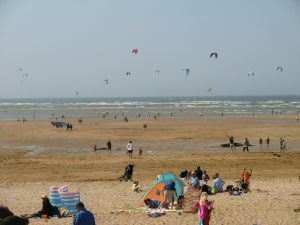 Looking for leisurely sport in Normandy ? Have fun in the water at the seawater swimming pool in Deauville, or at the seaside, which offers every watersport imaginable (75 miles (120 km) of coastline, 2 beach clubs, 110 nautical societies!). And let’s not forget sea-canoeing, which you can do at Trouville for instance, or river-canoeing in Pont-de-l’Arche or Clécy. Of course, Normandy is horse country, and you can admire the finest specimens at racecourses or on the numerous stud farms that cover the Pays d’Auge region. 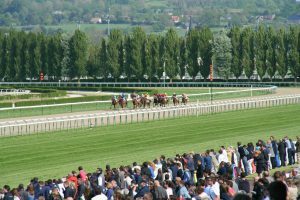 Horse-lovers might also be interested in: the yearling sales in Deauville, polo tournaments, and the Haras National du Pin (national stud), which is less than an hour’s drive from Les Marronniers. If you are looking to combine the pleasures of horses with nature, then the small company “Cavalcades” offers personalised hacks, the grand finale being a ride on the beach at sunset . . . .
Opt for a round of golf on one of Normandy’s 14 courses, many of which are at the seaside. If you like thrills, why not go rock-climbing in Norman Switzerland, bungee-jumping at the viaduct of La Souleuvre, car-racing on the track of Pont l’Evêque or on one of the many karting tracks, site-surfing in Deauville or sand-yachting in Cabourg? For more moderate excitement, you will find several treetop adventure parks in Normandy, including at Espace Normandie Aventure in Saint-Martin-de-Boscherville. 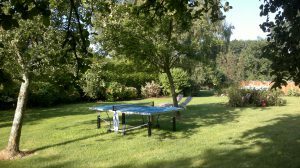 At Les Marronniers, there is ping-pong, trampolining, or walking in the woods or down the lanes. Looking to meet creative artisans in their studios, or for artistic and cultural discoveries in Normandy? Normandy is the birthplace of Impressionism. It has attracted and continues to attract numerous painters, writers and musicians: Proust in Cabourg, Boudin and Satie in Honfleur, Monet in Giverny, the Impressionists in Le Havre. You can retrace the steps of many of them and (re)discover their work in the region’s museums: Musée des Beaux-Arts (Fine Arts Museum) in Caen, Musée Boudin in Honfleur, MUMA in Le Havre to name but a few. But art is not only a question of museums: you can visit numerous exhibitions put on by contemporary and local artists in the towns and villages of the Pays d’Auge (Grange aux Dimes in Cambremer, Beaumont-en-Auge, Honfleur, the modern art museums of Caen and Le Havre, etc…). 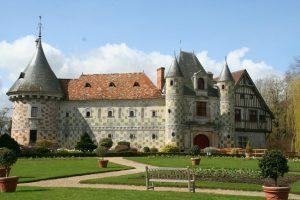 As a land of art and history, the Pays d’Auge invites you to discover its artistic trades at its annual Métiers d’Art festival at the castle of Canon in April and in Deauville in July. Looking for great musical or cinematic sensations in Normandy? Calvados is home to many musical festivals, like that of Beauregard in early July or “Les Boreales” in Caen. The Pays d’Auge is also a land of cinema, with the Deauville American Film Festival, Honfleur Russian Film Festival, Cabourg Romantic Film Festival, and Houlgate European Film Festival. 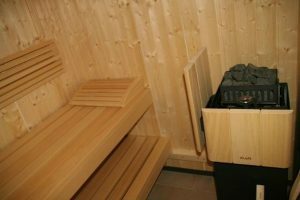 Looking for an original atmosphere for your business trips in Normandy ? Stay in a restful environment with warm hospitality and a customised room, where you will be not a customer but a guest. Free Wi-Fi access for those who can muster a little more work in the evenings . . .